Yasir Qadhi, self-proclaimed scholar and Dean of Academic Affairs at Almaghrib Institute, has recently become even more active in requesting the general Muslims to keep away from the scholars of Islaam, and to rely completely on Westernized and apologetic preachers like himself and those connected to his Almaghrib Institute, those currently being set up as replacements for the actual scholars of Islaam. 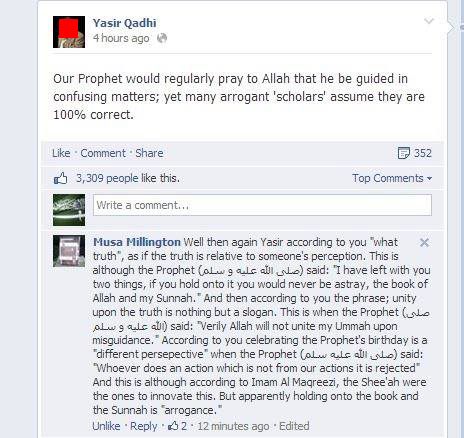 In a recent speech about “modernity” in December of 2013, Yasir Qadhi tells stories of the “stupidity” of the scholars of Islaam throughout history, and how their rigidity and lack of connection to the people has always kept Islaam and the Muslims from progress. After laying down the foundations for the scholars to be viewed as a bunch of clowns to be laughed at, he introduces a shining brand of “scholars” who are forward-thinking and actively connected to the people. Who are they? They are the deviant political activists of the Muslim lands, those the scholars of Islaam have warned against time and time again, the likes of Hassan al-Bannaa, founder of the al-Ikhwaan al-Muslimoon Sect, and Saudi activist Salman al-’Owdah, whom Yasir praises highly as a “forward-thinking realistic scholar”.